The old barn were transformed and divided into 2 comfortable, private, fully equipped, fresh and easy to live in chalets, perfectly furnished and spacious enough for groups of up to 8 per chalet, and at the same time, still cosy enough for a break away weekend for 2. The Chalets are both very similar and offer a full kitchen, 3 private bedrooms, 2 bathrooms (bath and shower), open space living area and large stoep. Wilgerboom chalet can sleep up to 8, Bergstroom chalet up to 9. Combine both chalets for a relaxing getaway and get-together for the whole family. Enjoy ample time for a 'braai' on our large, relaxing, undercover stoep, with a custom build fireplace, safely protected from the elements. Inside, the chalets offer electric lights, fridge (with freezer compartment), microwave oven, stove and plug points as well as a flat screen TV with Easyview. During Winter months easily warm up the entire chalet with a cosy and perfectly situated fireplace. Bedrooms are upstairs with a child friendly safety gate on the staircase. Bedroom 1: Queen bed. Bedroom 2: 2 single beds. Bedroom 3: 3 or 4 single beds. 1 Extra bed downstairs! Fresh linen, pillows, duvets and towels are provided (Comfortable blankets, Winter linen and warm water bottles are supplied during Winter months). Chalets are serviced daily by cleaning staff. FIRE & BRAAI WOOD: Winter months receive a complimentary bag of fire wood. More firewood available @ R30 per bag. Braai wood available @ R30 per bag. (Please note that stock is limited). Sit back and breathe it all in. The perfect 'stoep' for a 'braai'. Comfortable, private, 'easy to live in' accommodation. Cosy fireplace to end of your day of relaxation in the mountains. Queen bed. Fresh linen, pillows, duvets and towels. Bedroom with 2 single beds, as well as a bedroom with 3 single beds. Balance due on arrival. Cash or per EFT. No cheques and no credit card facilities. 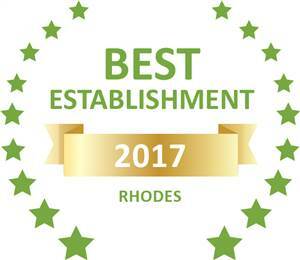 We are delighted to present you with a Afristay Travellers' Choice Award for being rated one of the top accommodation destinations in Rhodes!